The grandmasters of Teutonic heavy metal, U.D.O., return with a new studio album in early 2015. After the success of Steelhammer and the live album/DVD, Steelhammer - Live From Moscow, U.D.O. are busily working on new material. Udo Dirkschneider and his band will release Decadent in January. Says the band: "That's it! Our new album is recorded and after each one got sunburned, everybody must deal with their weather at home......hahaha. 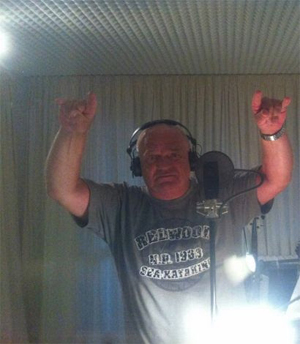 Udo (Dirkschneider) left with the new album, and I guess Mattes and him are already mixing it!! Francesco (Jovino) recorded his drums in his studio in Italy, as we did with Steelhammer. It was a pleasure to have Kasperi (Heikkinen, guitar) and Andrey (Smirnov, guitar) in the studio. Just to sit there and listen what they are doing!!! And they did great! Already a big thanx to our team, Mattes, Holger, Markus. We are very happy with the result, and of course we will keep you updated..."
Stay tuned for more album details, coming soon!